Our homes are our fortresses where we run to, after a day in combat with challenges of the day. It is where we lay our paraphernalia and sink onto our throne and take all in. The thought of your home should conjure a happy feeling – a relaxed one. And to achieve this, we must make them as beautiful as possible, and hedges have an essential role to play. And all thanks to technology, we now have convenient hedge trimmers transform our outdoors into admirable spaces. In the following write up, we review some of the best gas hedge trimmers to make your task of choosing one so much easier. 1 What are Hedge Trimmers? Hedge trimmers are tools specifically designed to prune, cut or trim hedges, bushes or even solitary plants, mostly flowers. These devices are available in different designs in manual, as well as, powered models. The manual trimmers are environmentally friendly and take a little breaking of the sweat – which is not a bad thing. Hedge clippers or shears do not need anything to operate except your energy. However, they are quite labor intensive and may take a lot of your precious time. And another thing, these tools are not too safe especially if you are not accustomed to using them – you can hurt your hands if they malfunction or used improperly. Motorized hedge trimmers are the advanced versions which are easier use. They allow hedge trimming to be faster and more efficient. Powered versions come with a safety feature that you need both hands on the handles for them to work. 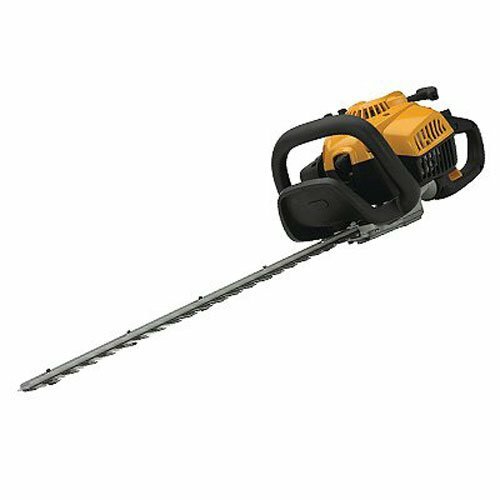 There are basically two versions of motorized hedge trimmers – the gas and the electric powered. The gas trimmers have more power but are a little heavy. The electrical versions tend to be lighter and produce minimal noise. They are also less polluting in comparison to their gas counterparts. However, they demonstrate less power and may need a cord to an electrical outlet – unless they are battery-powered. There are also tractor-mounted trimmers – quite the heavy duty versions. These trimmers incorporate a hydraulic boom and a finger-bar mower-like mechanism. However, these tractor versions are not that common. Convenience: motorized hedge trimmers are a necessary evil especially when it comes to gardeners. Regardless, you need something that will suit your needs appropriately. Some of us love the manual effort that goes into a gardening task and would instead use the shear and others similar tools. The majority of us, though, would prefer using a trimmer rather than poke around all day. What matters is convenience – what feels convenient for you. Versatility: the best trimmer will work on bushes, shrubs, privet hedges, foliage and branches among others. With a quality hedge trimmer, you can quickly get creative and play around with different designs on your garden landscape. Type of Vegetation and Physical Strength: there are different kinds of vegetation we can have in our yard. That coupled with our physical strength should go into determining the type of trimmer you need. The gas-powered varieties are best-suited for extensive areas and heavy-duty tasks. They demonstrate considerable power but are quite heavy.And then there are the electrical-powered trimmers. Their power is relatively good – not as good as the gas-powered machines – and do not demand a lot from you. They are environmentally clean and easier to use. However, they are limitations such as the cord and weather – you cannot use them when it is raining.Battery-powered trimmers are convenient and do not require a lot of your strength. Their weight is in between electric trimmers and gas-powered trimmers. Their power is not so much, and you should use them for light tasks. The Blade: trimmers make use of sharp metal teeth to slice away at leaves and shrubs or hedge. Basically, the blades can either be one-sided or double-sided. The one-sided ones are a lot safer as they cut away from you. This means that they are a lot safer. The double-sided varieties need you to be extra alert as they work.Blade length is another important consideration when choosing a trimmer. Longer is better and efficient as it reaches further making your task easier – and faster. Their only shortcoming is their weight. They are more cumbersome to handle and require extra care. An average length of 20 inches is not so bad for dealing with a hedge at your home. 24 inches can easily manage several plant types. However, if it exceeds this length, then be sure you can handle it – we are talking muscle strength here. Maintenance: different types of trimmers have different maintenance needs. Among the three major categories, the gas-powered seems to require a bit more maintenance. You will need to keep abreast of the amount of gas they have, the right mix of oil and gas and that spark plugs are clean.For all types of trimmers, you will need to check the teeth and determine if they need sharpening. You will also check whether they need replacing. If you are looking for a heavy duty trimmer that will handle commercial landscaping, then you will not be on the wrong choosing this. Tanaka has a 21.1 cc engine powerful enough to start, and finish a long task – this is what you expect from a reliable gas hedge trimmer. It has a forward facing exhaust to ensure a clean job. 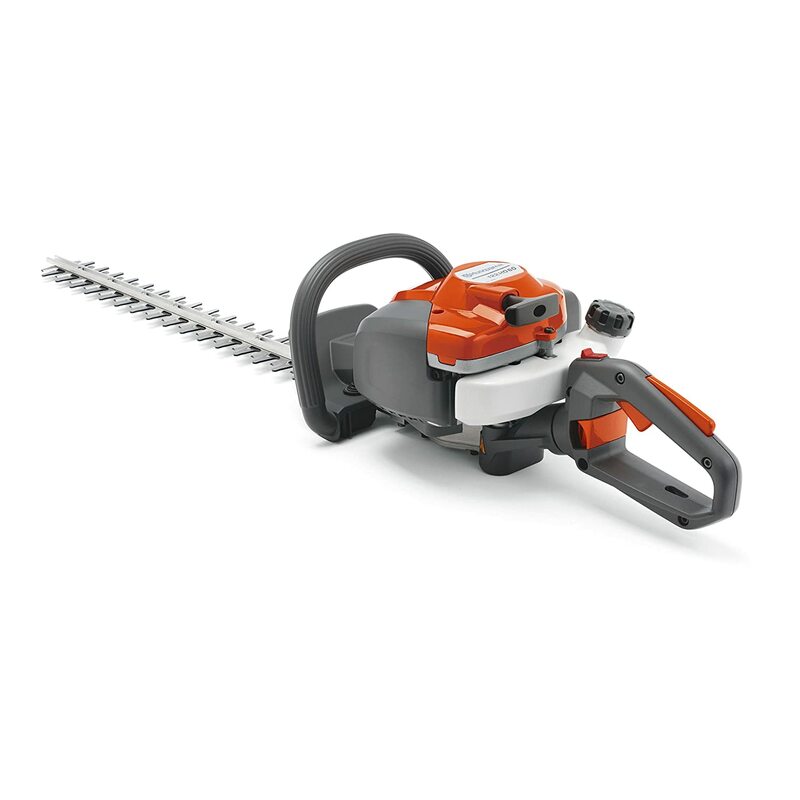 This is another quality hedge trimmer that comes with a powerful 21.1 CC engine. It has an efficient filtration system that extends the life of the engine. And for comfort and excellent control, the machine comes with a long handle – necessary for such a powerful device. There is also a large front handle for enhanced control of the machine. 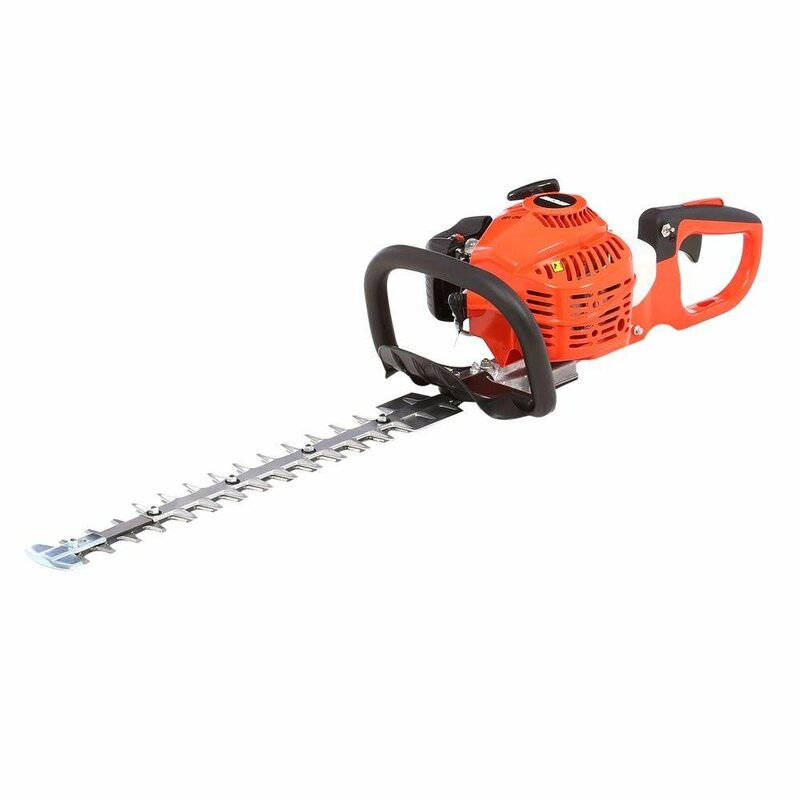 At 28cc, this hedge trimmer has one of the most potent engines which can handle any kind of bushes or hedge – such a heavyweight machine you may enjoy using. Its blade is 22 inches – adequate for most tasks. The trimmer comes with a swivel-position handle that enables you to change position easily and for comfortable and secure grip. Husqvarna is a household name when it comes to anything farm equipment, and tools and this 21.7cc machine are a testament to that. The trimmer comes with a smart start engine that makes it easier for you to jump in right away to your task for the day – you can really waste a significant amount of time trying to start machine that won’t budge. The carburetor air purge system is the one responsible for the smooth start system – thankfully! And to make it easier for you to reach the topmost plants, the trimmer has an adjustable rear handle – this makes it quite convenient. This machine from Husqvarna is specially designed for home use – its features pretty much indicate that. 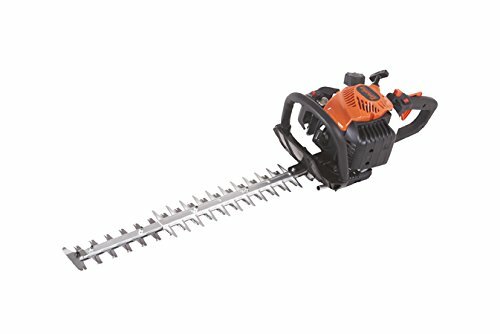 For starters, this hedge trimmer is lightweight and will not require a lot from you in terms of strength – no need to call the local gardener. It has low noise and may not prove interruptive to the neighbors – especially those that have decided to take a long overdue rest in bed for the weekend. Every homeowner and commercial landscaper needs the best gas hedge trimmer to come up with the best designs on hedges. A good trimmer is comfortable to use, durable and demonstrates a significant amount of power to handle any task that you throw at it – yes, hedge tasks and anything else involving vegetation cutting and designing. All the above are decent choices and will prove reliable to have around. However, we will have to go with Tanaka TCH22EBP2 21cc 2-Cycle Gas Hedge Trimmer. This machine has a powerful engine that may handle any type of vegetation you throw at it. The trimmer also boasts a 24-inch blade that makes your task quicker and easier. It incorporates an easy-pull technology for an easier start so you can jump right into your work for the day without wasting time.